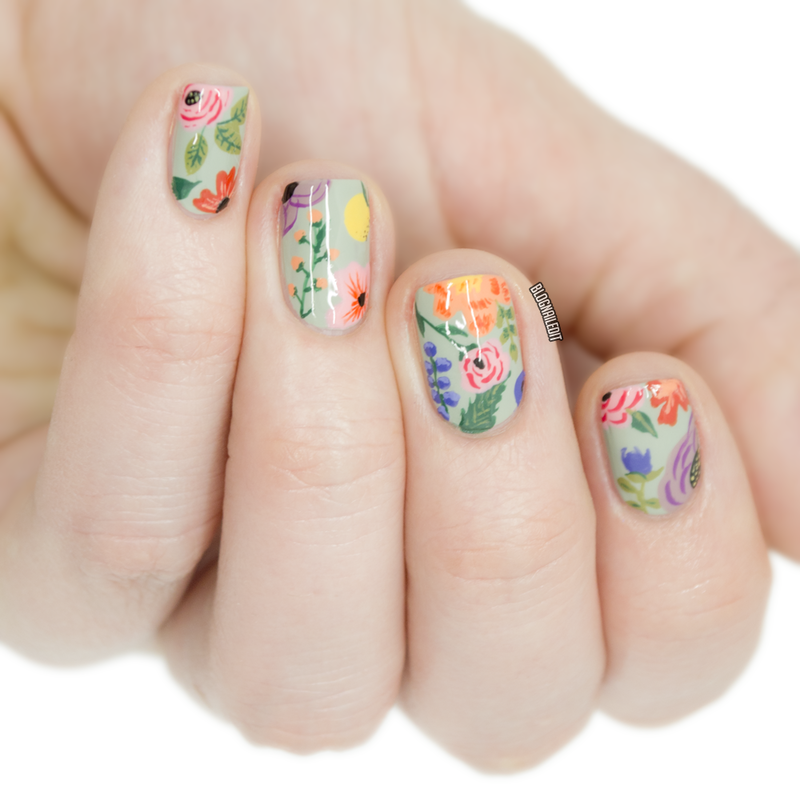 Anna Bond is the creator of some unbelievably beautiful florals that have been inspiring nail artists for years. Her creations can be seen on almost anything a print adorns, as she is the co-founder for Rifle Paper Co. 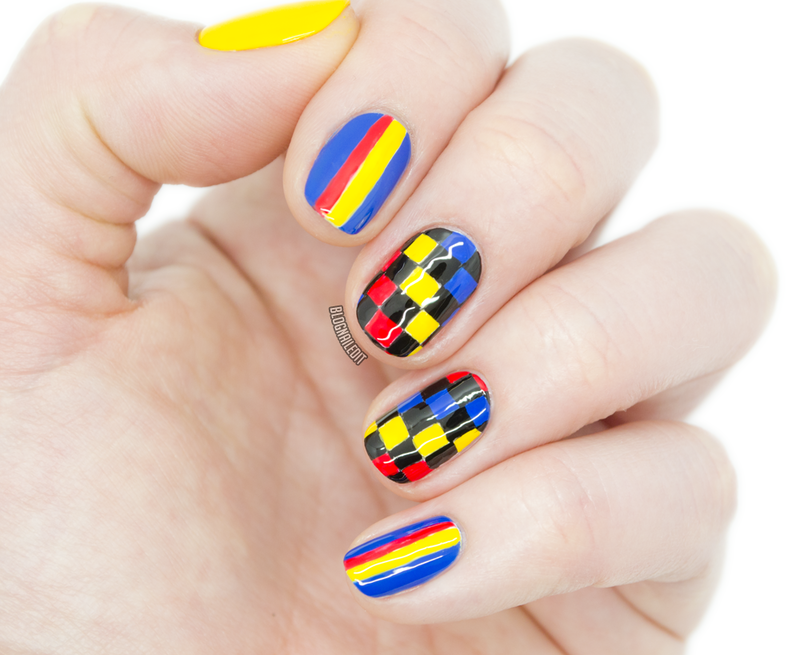 I've been following her work for years, and today's nail art was inspired by this design recently shared on her Instagram. I happily spent a few hours just freestyling each finger based on that design, and here's the result! Of course, everything is freehand. Thank you for inspiring me Mrs. Bond! Valentine's Day is right around the corner, so I got a head start on design ideas last night in my premier Instagram live video! 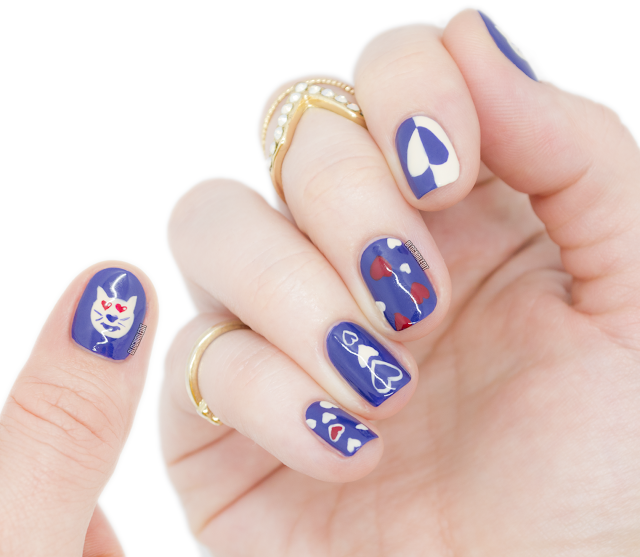 It was fun, and with the help of a few lovely viewers, I freestyled all 5 fingers with a heart-theme. 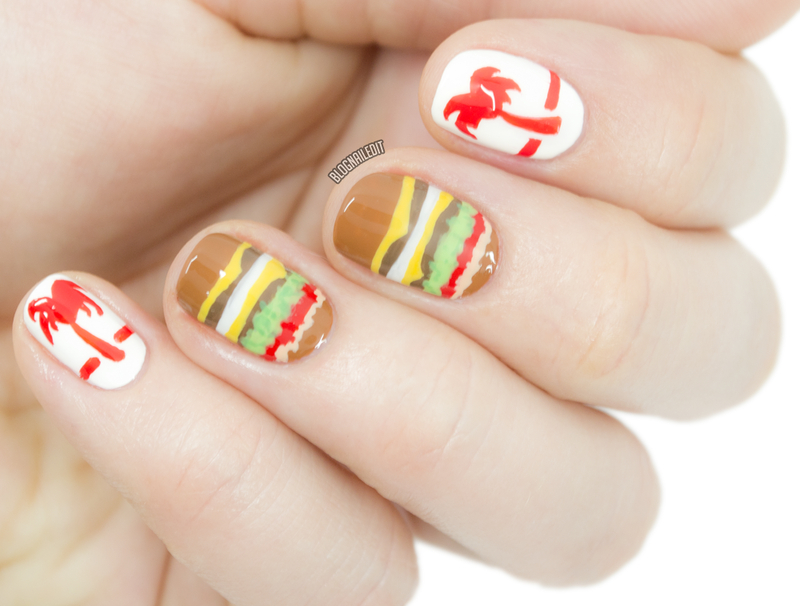 (Thank you in particular to @terranceburger and @zeeohee, who helped me come up with the thumb design and the name for it.) To make it a little more fun, I invited viewers to join me for a beer. I enjoyed a Liquid Paradise IPA from a Colorado brewery, New Belgium. I also played music from the Spotify "Creamy" playlist for the first half, but due to Copyright issues, I was asked to turn it off if I wanted to continue live streaming. The full live feed (broken up into two design videos and one "apologies-to-Instagram-for-playing-music" video) will only be available until around 8:00 MST tonight), but for those of you without Instagram, here's the final look! I used only 3 colors for the look, including Baylor (nail & bone), Love is in My Cards, and My Vampire is Buff (both from OPI). I'd love to do a live video again sometime. Any ideas or requests you'd like to see? You know me as a nail artist. Some of you know me as a nail tech. Some of you are friends, and some of you are family, and know me as such. None of you know me as a race car driver though. And after speeding a kart around a track at 40 MPH last night at Unser, none of you will. I came in last...but gracefully, and with style, thanks to this racing look I did beforehand. There are actually 5 colors used here, but the unsung hero that is Sharktooth (Jessica Cosmetics) is the white beneath the red and yellow to pop them. That beautiful blue is Sia, and the yellow is Darcy, both from Zoya. The fiery red is Flame-boyant (China Glaze) and the black is Black Onyx (OPI). Happy New Year everyone! 2019...it's weird to say. I started this blog 8 YEARS AGO! 8 years ago, I thought what other girls were doing, sharing their nail pictures and playing around with graphic art in blog form, was so cool, that I gave it a shot. I figured, "Why not? I like nail polish too!" It was humble beginnings (check out this early post), and it wasn't really for anyone but me. If someone else read it, cool! If not, it was a good excuse to stay busy after work. Then, it exploded. Posts were shared, tutorials were shared, magazines picked me up, and before I knew it, I was switching career paths to pursue what I thought would be a silly hobby. And here we are, 8 years later. I didn't make any resolutions this year, but I did get a little bit of an idea I'd like to try to keep up with. While shopping for a new planner, I came across a journal with 300 drawing prompts. Just half pages with words at the top to inspire you to draw. After having so much fun with Inktober, I tossed the book into my basket with the resolve to do some from time to time. No commitment, just some inspiration. Then I did today's design. Which wasn't inspired by the journal at all. 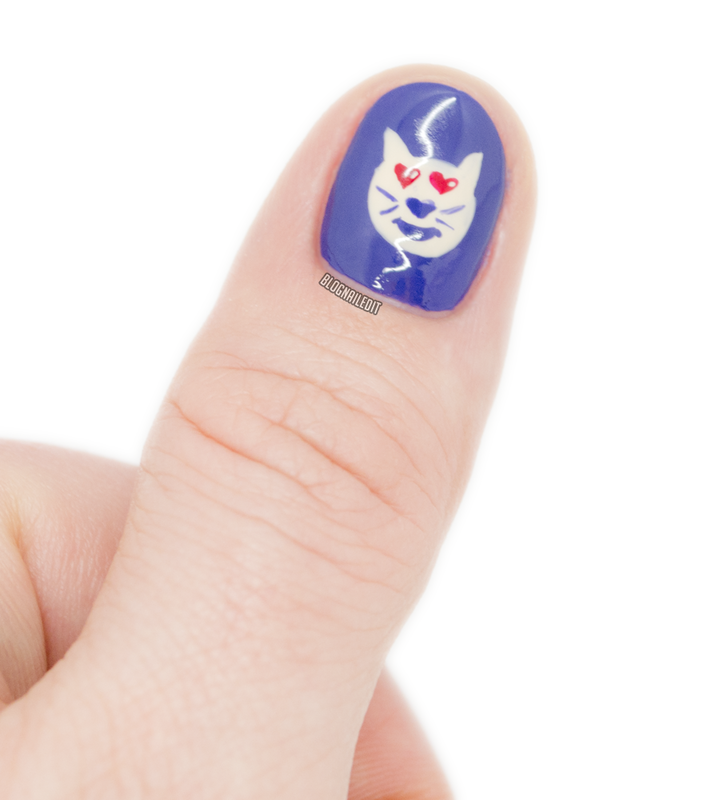 It was actually an idea taken from this Born Pretty stamping plate. I just simplified it with some basic colors (Act Your Beige! and Black Onyx from OPI). It's like champagne bubbling up from the bottom of a glass. So cheers...to many more years! If you're a West Coast kid, you'll get what I did for "double," day 29 of Inktober. Google it...I even got the layers right. And the sesame-seed-less bun...hungry yet? I've got 4 more days of Inktober to catch up on, so let me "gift" you with day 28. Since it's not Halloween-time anymore, here's a little sneak peek into a holiday look you could try for winter! Over a base of Marshmallow (essie), I created some wrapping paper with Toast It Up! (China Glaze) and Snap Happy (essie). I was going to do all of my nails as presents, but I liked the bow accent on just one, so I added the dots to spice it up a little. When you think of "thunder" (our prompt for day 27), your mind probably goes to lightning immediately. Mine does too. 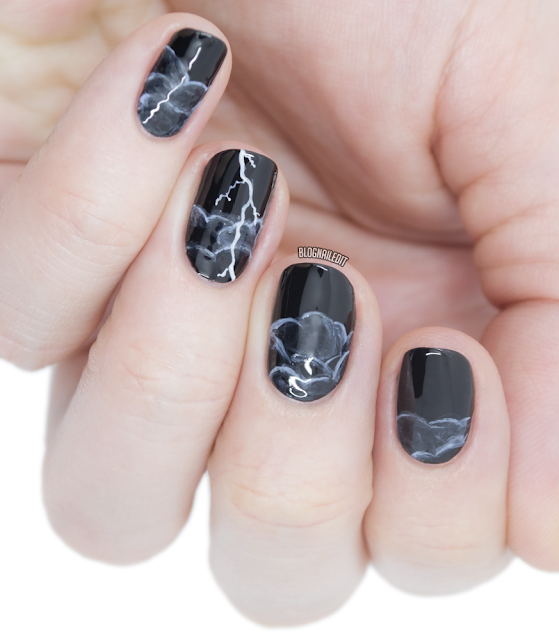 BUT...I wanted to do something that wasn't just about lightning, so here are my thunder clouds rolling in on my nails for Inktober day 27. This was a two-color design, both from essie: Bikini So Teeny and Licorice. The thunder clouds are better from far off, but they're not so horrible up close. I just smudged the lines with acetone to give them a more "distant" feeling, and added one lightning bolt for effect.